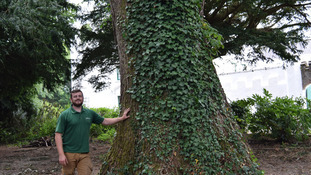 A tree believed to the be the oldest living on the Isle of Man has been treated for Dutch Elm disease. Milntown Estate in Ramsey is where a 300 year old tree has had affected branches cut, to ensure it doesn’t spread to the rest of the tree. Four other trees were identified as diseased, three of which have been removed, with two more showing signs to be tested. The Manx public are being asked to look for evidence of Dutch elm disease in the island’s elm trees, with an appeal from the Department of Environment, Food and Agriculture to ‘See It, Snap It, Send It’. Dutch Elm disease is caused by a fungus which is spread from infected trees to healthy trees by elm bark beetles. This year’s warm weather has created perfect conditions for the beetles to move between trees and spread. The disease didn’t reach the Island until 1992, by which time the UK had lost 90% of its elm trees – around 20 million. Such was the scale of the devastation in the elm population in the UK and further afield, many authorities are simply resigned to the fact that the disease is rampant. The Isle of Man is therefore relatively unique in its proactive focus on prevention of the disease. This has involved a vigorous programme of felling and burning over the past quarter of a century.